On January 7, 2009, Justine was returned to love, as she would say. Her life was a full and remarkable journey that touched thousands around the world, directly and indirectly. What she had thought would be her life path – wife, mother, and teacher – was abruptly redirected when Black Panthers Fred Hampton and Mark Clarke were killed by Cook County (IL) sheriff police in 1969. In response, she felt compelled to become active in anti-racist action and this caused her to resign her teaching position at Bloom Township High School. From then on, her life was essentially a journey of spiritual searching and discovery. She wrote short stories, plays, and poems along the way. 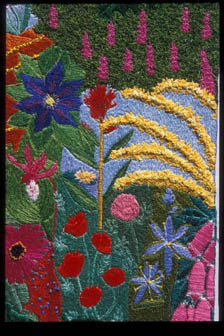 She created embroidered memories and facilitated workshops using embroidery as a way to help others work through their own fear, pain, anger or grief. 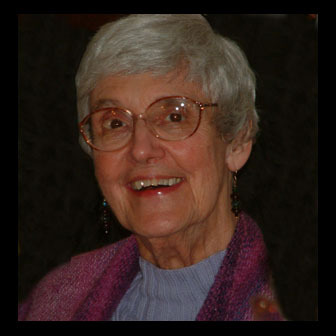 She made vows of simplicity and devotion to God in Denver in 1975. Out of her fear of nuclear war she was inspired to wrap a symbol of war, the U.S. Pentagon, with a symbol of peace, The Ribbon, created by pieces of fabric on which tens of thousands had illustrated what they would grieve most in the event of a nuclear holocaust. This inspiration was realized on August 4, 1985, the 40th anniversary of the bombing of Hiroshima. Justine traveled nearly every continent. 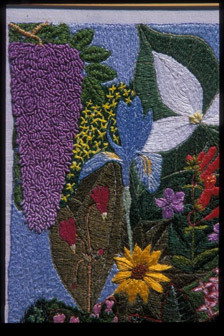 She cherished the Earth and every living thing and prayed vigilantly for everyone she knew, ”and all there to attached.” In the end, she came to understand herself as an artist, her needle and thread her medium and the act of embroidering an expression of her profound faith. Please visit Justine's memorial pages at www.sympathytree.com/Justine_Merritt to view and share memories about Justine. Please find, below, the Main Menu to Justine's web content.